MACD rose 2.7 points to 2.95. RSI rose 7 points to close at 73.78. RSI sits at its highest overbought level in a year. Though before one assumes a major correction is about to unfold, I note that RSI hovered around 70 for about 6 weeks from late September 2017 through early November during the bull surge where the INK CIN ran from 1190 to 1275. And if we look back further, we see very persistent levels of elevated RSI in the 60-70 range occurred from March through August of 2016. That's when the Index soared 18% from about 960 to 1130. Indeed, we can say that during highly bullish periods and full-fledged bull market rallies, momentum indicators can remain overbought for weeks at a time as rising prices squeeze panicking short-sellers. Support is at 1075 (20-day moving average) and 1056 (50-day moving average). Resistance is at 1125 and 1155. 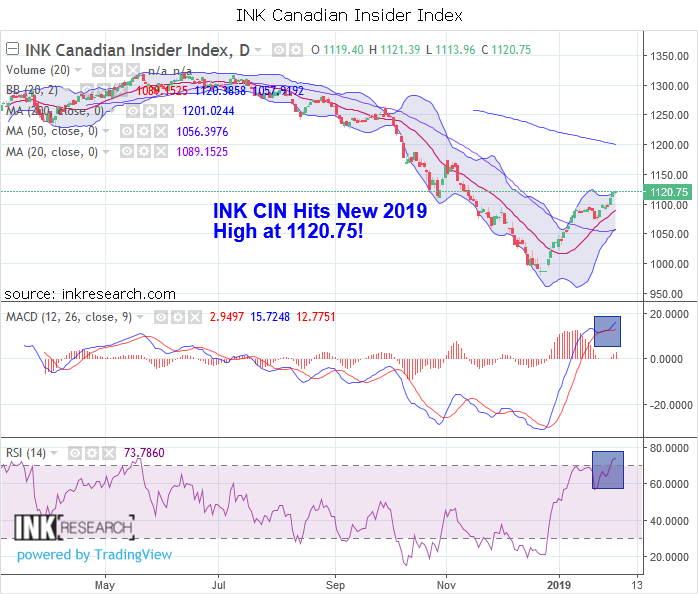 We could see a pause or mild pullback over the next week or so in the INK CIN, but I look for commodities and risk-on sectors to move to higher levels in coming weeks. The rest of the month will be interesting, for I think smaller capitalized stocks in these sectors (including many that have not participated in the rally thus far) have the potential to see opportunistic accumulation and climb even on down market days.